Handmade vintage inspired silk crop top with front tie and amazing billowing bell sleeves. This incredible 100% silk crop top is the perfect addition to any outfit, with flowing sleeves and bohemian vibe, this is an amazing bespoke piece to add to any wardrobe! We hand select all of the sari fabric ourselves before we make them into tops for you to wear. They are all handmade using recycled sari fabric that we hand source on our adventures in India, meaning that no two are ever the same and are just as unique as you are! 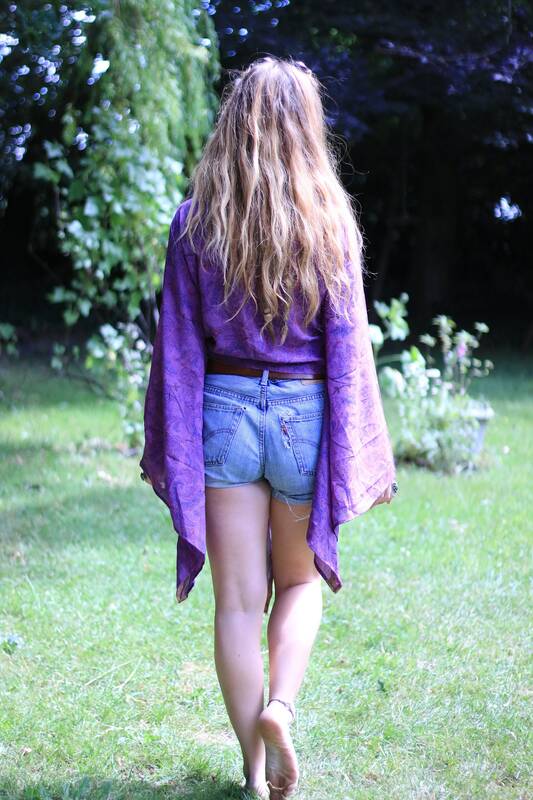 Team with flares and a waistcoat, some high waist shorts, or throw over a vest as a kimono for that bohemian 70's look! *All of our sari fabric is recycled so may show signs of wear, this is not a defect and should not attract from the beauty of the patterns or pieces but part of their story and charm.